When we talk about Apple, we usually talk about devices—iPhone, iPad, Macbook, etc. That’s, of course, because those are the big money-makers for Apple. Indeed, in the last quarter, iPhone sales accounted for more than half of Apple’s revenue. But what about iTunes? While Apple is a device company, it also makes money off of content sales. 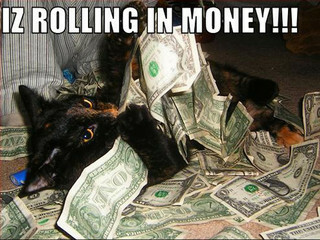 Just…not a whole lot of money. Nevertheless, there’s big potential there. Tim Cook noted in Apple’s earnings call last week that Apple now has over 800 million iTunes account holders, most (but not all) of whom have credit cards on file. So Asymco analyst Horace Dedieu worked up this handy little chart to show the massive gap between the number of iTunes accounts that Apple has versus the number of active customer accounts Amazon has. 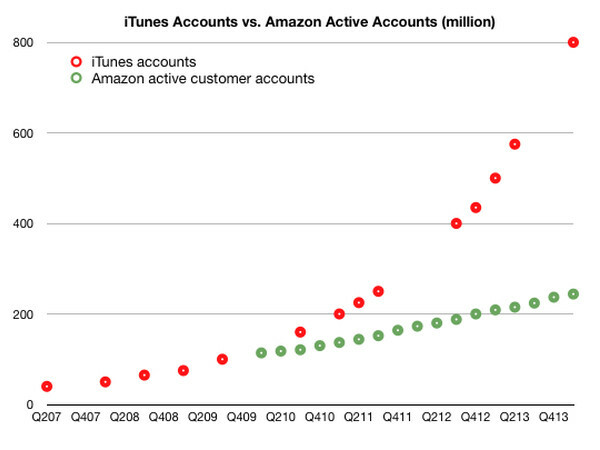 The gap is pretty startling: Apple has nearly four times the number of accounts Amazon has. While Amazon doesn’t share numbers, it’s estimated to have something to the tune of 200 million active customers. 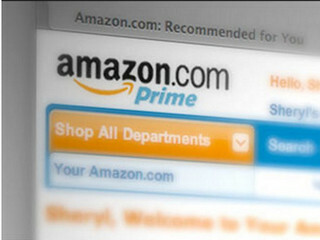 Consumer Information Research Partners previously estimated that as of Q3 2013, Amazon only had 41.3 million unique buyers in the United States. That’s a far cry from iTunes’ 800 million accounts, but before we go calling Apple the victor of the content wars, it bears noting that people spend A LOT less on iTunes than they do on Amazon. Meanwhile, the average Amazon customer spends about $1000 a year ($1,300 for the average Prime subscriber and $700 for the average non-Prime subscriber). Obviously, that’s because Amazon is an e-commerce company and Apple is not, so it makes sense that people would spend a lot more on Amazon than they would on iTunes. Nevertheless, the massive difference between the two companies is striking. Apple has sold 500 million iPhones and 170 million iPads to date. Naturally, there are a lot of people who still just use iPods and/or Macs to buy music and videos online. Either way, Apple has a lot of potential for user monetization while Amazon is doing what it can to stretch the dollars of every one of its users. With each iTunes user only spending about $5.70 per quarter, Apple has a lot of room to grow. “We see this as a weak number considering Apple’s brand strength and loyal user base,” wrote J.P. Morgan analyst Rod Hall in a recent research note.